It has taken me two years to find a treatment that would reduce my hyperpigmentation spot I have on the forehead, probably due to pregnancy and sun damage. The exciting news today, is that, I HAVE FOUND IT! Yeayy!! I have been trying several serums these past few years, (Dr, Perricone; Dr. Brandt, and even specialized dermatologist treatments), but none of them seemed to do what I was looking for. Until I found THIS: Sunday Riley and her Good Genes. OMG!! I think I have no words for this product. After one week of use, I started to see WOW improvements on my face. My spot started to fade away, (it has not disappeared yet, but it is much lighter now), my pores have shrunk, my fine lines are now smoother, and overall I can see that my skin looks brighter. You must think I am exaggerating. I am not!! It is all true!! 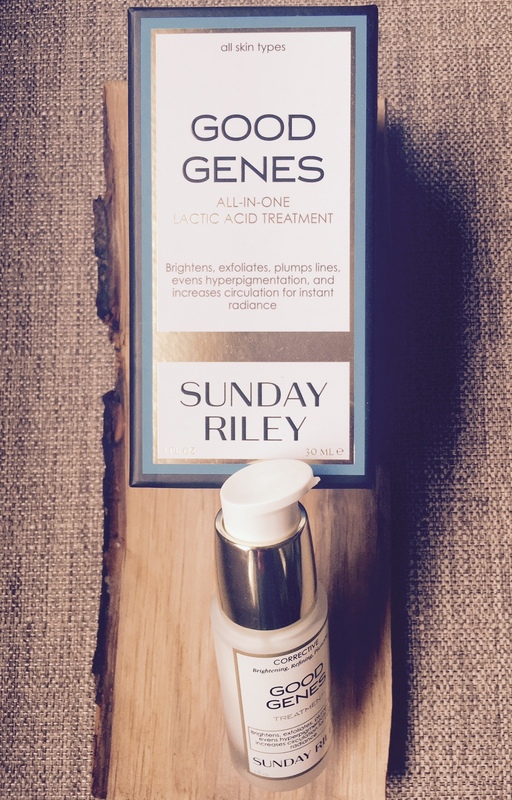 However, as you may know, I am very consistent with my daily cleaning routine, and I also apply my Hyaluronic Serum along with my Sunday Riley, which I am sure also helps. But, nevertheless, I think this treatment serum does wonders. The downward side of it, is its price. $103 for the bottle. Its size is quite good, but it can get a bit expensive for some pockets. Being that said, I think it is worth every penny. It has a perfect combination of pharmaceutical-grade ingredientes, all packed up in this beatiful bottle, made with no sulphates or phthalates. Listen to what it has: Unneutralized lactic acid, which helps in plumping fine lines, by increasing epidermal firmness and thickness, and renewing skin. Licorice, which will help brighten your skin, by fighting hyperpigmentation, and working as an anti-inflammatory. Arnica, will work as a booster in your circulation and will help counteract the sting of lactic acid. Squalene, will help repair your skin barrier. And, finally, yeast extract, will encourage a healthier skin look. When you apply it to your skin, you will feel a slight sting for a minute or so. I think it is a completely manageable sting. However, I have read reviews of people saying that they could not stand it. This may be exaggerated, but if you have a very delicate skin, I would recommend you to try a sample first just in case. It is a treatment designed for all skin types, so there should be no problem. What are you waiting for? Try this unbelievable wonderful treatment cream buy buying it here: Good Genes. And by the way, if you have a special date, you can also use this product as an instant brightening mask. You will look like a movie star at the red carpet. 🙂 Remember to close the cap each time you use it, as it will preserve the ingredients for longer. If you want to get your sample first, head to Sephora and ask for one. Please leave your comments below and let us know how it has worked out for you. Enjoy the rest of your day and Gogloow! Thanks so much for joining me in my beauty journey. 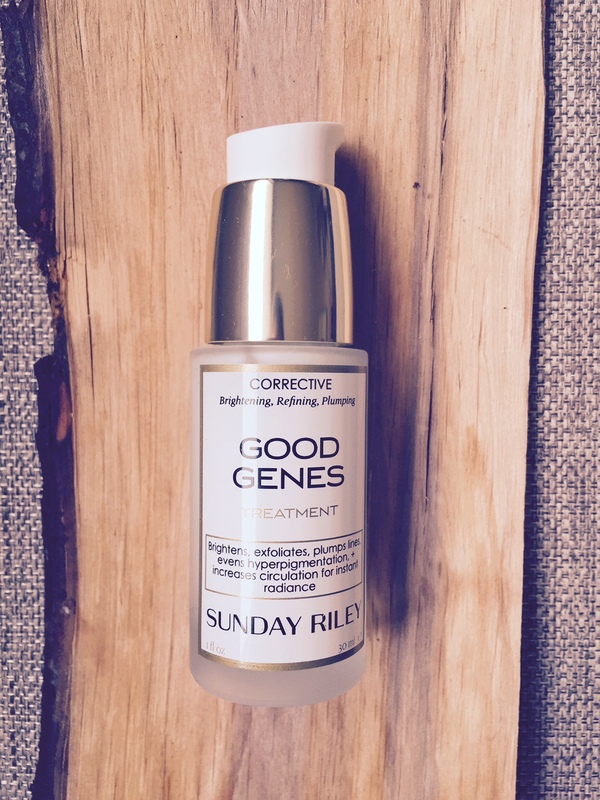 Tags: amazon, Beauty, beauty glow, Brightening Treatment, Good Genes, Sephora, Sunday Riley. Bookmark the permalink. Previous post ← Looking for some Hair Glow? It’s good to know of products like this, you never know when things will appear. I love the Sephora is so good about samples! I always forget to ask. I’d love for you to share a post at my link up today, if you’re interested! The details are right on my blog under ‘Tell ’em Tuesday’. Thanks!!! I will!! And do try the cream, its fantastic!! Hola!! Gracias por dejar un comentario. Si te soy honesta, esta crema e gustó mucho cuando la use pero si de verdad quieres quitarte las manchas usa Nerium night cream. Es la única crema a día de hoy que me ha quitado las manchas oscuras que tenia. Donde vives? Dependiendo donde vivas puedes comprarla o no.